This may be speculation on my part, but I noticed a pattern. Some scholars who are anti-abrogation (overtly or covertly) seem to try a "diplomatic" approach to the debate by conceding some points to the pro-abrogation crowd in the hope that the rest of their argument will be more readily acceptable that way. In the case of Afaana, he is overtly anti-abrogation, so he is going overboard in saying that 2:106 is what pro-abrogation folks think, except that the abrogated verses are gone. Hassaballah says yes maybe there are abrogated verses in the Quran, but arguing that based on 16:101 and 2:106 is not the right approach. Qaradawi says there are "almost" no abrogation in the Quran. You get the pattern. I think diplomacy should be exercised in style not in substance. What is true is true regardless of all else, and there is absolutely no way around that. Some scholars who are anti-abrogation (overtly or covertly) seem to try a "diplomatic" approach to the debate by conceding some points to the pro-abrogation crowd in the hope that the rest of their argument will be more readily acceptable that way. And it didn't work! In my online search for an outlet that sells `Afaana's book, I found several sites attacking him and even mocking his book's title with phrases like القرار الصواب عدم شراء الكتاب! Fundamentalists cannot be cajoled. They do not want people reaching out to them; they want people folding under their beliefs. They break bridges. They're convinced they are absolutely right and that therefore any negotiation is cowardice in their character, dereliction in their duty to defend the doctrine and waning in their faith. In my online search for an outlet that sells `Afaana's book, I found several sites attacking him and even mocking his book's title with phrases like القرار الصواب عدم شراء الكتاب! LOL. See the advantage of picking a short book title that doesn't rhyme? One major element of verse 2:106, and a major cause for the give-and-take in interpreting it, is its use of heteronyms. Scholars had differing opinions on how to understand a heteronym: confine it to one of its meanings, or accept all of its meanings. The Hanafis and some Shaafi`is said that a heteronym cannot be used in all of its meanings because each meaning is specific. If a heteronym is used in eloquent speech, then some evidence must accompany it in order to clear its ambiguity. Otherwise, the speech would lead to misunderstanding and won't be so eloquent after all. A scholar, therefore, will have to fetch an evidence if such evidence does not accompany the heteronym. The word حُرُم can mean "have entered the Sacrosanct Mosque area" or "wearing Ihraam clothes (during pilgrimage or ritual visit)". Both meanings are meant in this verse. Neither person may hunt in this case. This discussion is helpful in interpreting verse 2:106. Both ننسخ and آية are heteronyms. Pro-abrogation scholars have insisted that both have only one meaning each, namely "abrogate" and "a verse in the Quran." But none of them have come up with a definitive proof of such limitation. The narrations they rely on which explain the circumstances of revelation of 2:106 (or 16:101) are inauthentic. IMHO, all of the meanings of both words were meant by God in 2:106. God can, if and when He wills, abrogate a verse of the Quran, or a prior scripture or law, or remove a sign, etc. The question is: Did He? If neither He nor his Messenger have told us then there's no way to find out! Clearly, 28:43-45 name verses of the Torah as آيات. What else and who else but Moses was reciting to the people of Midian? Bingo!!!! Even if it wasn't Moses and the Torah, 28:45 is explicitly referring to a previous revelation that is recited by the word "آياتنا" (Our verses, referring to God). I found that for some of the clear examples in the Quran of the use of aaya to mean verse in previous scripture, the standard exegesis interprets it as verse in the Quran instead. I haven't exhausted all of them yet. So I did extensive research to find if aaya was used by the Arabs to signify a verse in previous scripture, and I found the bull's eye in a passage attributed to "كعب الأحبار", a Yemeni Jew who converted to Islam either during the last years of the Prophet (PBUH) or the days of Abu-Bakr or Omar (RA). He is quoted in the exegesis of Al-Khazen, who is pro-abrogation as evidenced by his interpretation of 2:106 in the same exegesis. In the commentary on verse 6:1, he talks about the first verse in Torah and the last verse in Tora using the word aaya. هو أبو إسحاق، كعب بن ماتع الحميرى، المعروف بكعب الأحبار، من آلأ ذى رعين، وقيل: من ذى الكلاع، وأصله من يهود اليمن، ويقال: إنه أدرك الجاهلية وأسلم فى خلافة أبى بكر، وقيل: فى خلافة عمر، وقيل: إنه أسلم فى عهد النبى صلى الله عليه وسلم وتأخرت هجرته، وقال ابن حجر فى الفتح: إن إسلامه فى خلافة عمر أشهر، وبعد إسلامه انتقل إلى المدينة، وغزا الروم فى خلافة عمر، ثم تحوَّل فى خلافة عثمان إلى الشام فسكنها إلى أن مات بحمص سنة 32 هـ (اثنتين وثلاثين من الهجرة) على أرجح الأقوال فى ذلك. وذكره ابن سعد فى الطبقة الأولى من تابعى أهل الشام وقال: كان على دين يهود فأسلم وقدم المدينة، ثم خرج إلى الشام فسكن حمص حتى تُوفى بها سنة اثنتين وثلاثين فى خلافة عثمان، وقد بلغ مائة وأربعين سنة. وقال أبو مسهر: والذى حدَّثنى به غير واحد: أنه كان مسكنه اليمن، فقدم على أبى بكر، ثم أتى الشام فمات به. روى عن رسول الله صلى الله عليه وسلم مرسلاً، وعن عمر، وصهيب، وعائشة، وروى عنه معاوية، وأبو هريرة، وابن عباس، وعطاء بن أبى رباح وغيرهم. كان كعب بن ماتع على مبلغ عظيم من العلم، ولهذا كان يقال له: "كعب الحَبْر" و "وكعب الأحبار"، ولقد نُقل عنه فى التفسير وغيره ما يدل على علمه الواسع بالثقافة اليهودية والثقافة الإسلامية، ولم يؤثر عنه أنه ألَّفَ كما ألَّف وهب بن منبِّه، بل كانت تعاليمه كلها - على ما يظهر لنا وما وصل إلينا - شفوية تناقلها عنه أصحابه ومَن أخذوا عنه. وقد جاء فى الطبقات الكبرى حكاية عن رجل دخل المسجد فإذا عامر بقن عبد الله بن قيس جالس إلى كتب وبينها سِفْر من أسفار التوراة وكعب يقرأ، وهذا يدلنا على أن كعباً كان لا يزال بعد إسلامه يرجع إلى التوراة والتعاليم الإسرائيلية. وقال ابن سعد: قالوا: ذكر أبو الدرداء كعباً فقال: إن عند ابن الحميرى لعلماً كثيراً. وروى معاوية بن صالح عن عبد الرحمن بن جبير أنه قال: قال معاوية: ألا إنَّ أبا الدرداء أحد الحكماء، ألا إنَّ عمرو بن العاص أحد الحكماء، ألا إنَّ كعب الأحبار أحد العلماء، إن كان عنده علم كالثمار وإن كنا المفرطين. وفى تاريخ محمد بن عثمان بن أبى شيبة، من طريق ابن أبى ذئب، أن عبد الله ابن الزبير قال: ما أصبت فى سلطانى شيئاً إلا قد أخبرنى به كعب قبل أن يقع. أما ثقته وعدالته فهذا أمر نقول به، ولا نستطيع أن نطعن عليه كما طعن بعض الناس، فابن عباس على جلاله قدره، وأبو هريرة على مبلغ علمه، وغيرهما من الصحابة كانوا يأخذون عنه ويروون له، ونرى الإمام مسلماً يُخرِّج له فى صحيحه، فقد وقعت الرواية عنه فى مواضع من صحيحه فى أواخر كتاب الإيمان، كما نرى أبا داود والترمذى والنسائى يُخرِّجون له، وهذا دليل على أن كعباً كان ثقة عند هؤلاء جميعاً، وتلك شهادة كافية لرد كل تهمة بهذا الحَبْر الجليل. What are your thoughts, Linguistic? So I did extensive research to find if aaya was used by the Arabs to signify a verse in previous scripture, and I found the bull's eye in a passage attributed to "كعب الأحبار", a Yemeni Jew who converted to Islam either during the last years of the Prophet (PBUH) or the days of Abu-Bakr or Omar (RA). He is quoted in the exegesis of Al-Khazen, who is pro-abrogation as evidenced by his interpretation of 2:106 in the same exegesis. In the commentary on verse 6:1, he talks about the first verse in Torah and the last verse in Torah using the word aaya. So I checked the credibility of "كعب الأحبار" since he is the source of the quote. I don't think this is needed since we are only verifying the language used for our purposes here, but still I thought it would help. I'm aware of the different opinions on his credibility, but the evidence -as you cited- is in his favor. And, as you said, it's a linguistic issue. Arab Jews and Christians refer to passages from their scriptures as "aaya". That being said, I'm convinced, as scores of scholars past and new have concluded, that the word آية in 2:106 is referring to the Torah being replaced by the Quran. The verse is general, because God wants to establish a principle: If or when He decides to revise/update any of His signs, He brings a sign that is even better. The main reason the Quran is better than the Torah is that the Torah has been edited by the Jews while the Quran remained intact. And because they were editing the Torah, it stands to reason that the Torah had to be replaced in order for the word of God to see the light again. Lastly, verse 2:41, cited above mentions the word آياتي (My verses), to refer to the Torah. How do we know that? Because of the common clause "in order to purchase with it a slight gain" which links 2:41 and 2:79. Thus, it is quite reasonable to conclude that the word آية mentioned in 2:106 as the object of abrogation is referring here to the Torah in particular. I now have a guess about what Hasaballah had in mind, based on something Al-Arid mentioned on page 96 of his book. He mentioned that "some" think that "نأتِ بخيرٍ منها" does not mean "We bring better than it" but "We bring good from it". Linguistically possible but far-fetched in my view. 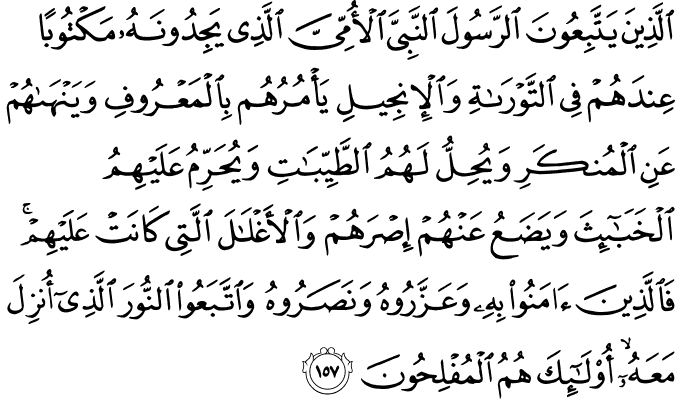 Anyway, if the continuation of the verse were "بِمِثْلِها" that would have made the possibility less far-fetched. However, "مِثْلِها" pretty much kills that possibility. So, it could mean "We bring good from it or We bring the like of it". I also continue to believe that the order of words is significant, as I pointed out in this post, i.e., "بخير منها" corresponds to "ننسخ" and "مثلها" corresponds to "ننسها". I am not basing my observation on any hard rule that I know of, just on how it sounds. In the case of 76:16, the two items are of the same class (vessels and cups). For this interpretation of 2:106 "good from it" and "a verse like it" are not of the same class, so the repeated بـ helps "disambiguate" (or help mitigate the oddity). Then again, I am an amateur in these things. PS: As I was proofreading the post, I realized I wrote "I am not basing my observation on any hard rule that I know of, just how it sounds" and added another "on" to make it "I am not basing my observation on any hard rule that I know of, just on how it sounds." I then saw that I was in fact applying the same rule discussed in the post!